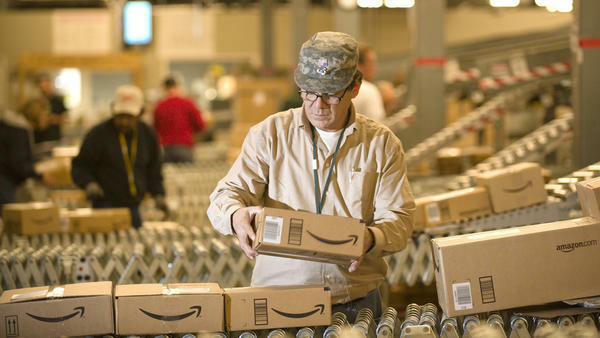 An Amazon worker grabs boxes off a conveyor belt in Nevada, one of a handful of states in which the online retailer collects sales tax. A bit of bad news. If you buy anything online, you are already required by law to keep track of your purchases and to pay the sales tax to the state (except in those states that don't have sales tax). This is known as a "use tax." It's safe to say, however, that most people don't pay it. So why would Amazon want to risk irking customers with the New Jersey deal? "Amazon has agreed to build warehouses in a number of other states in return for extending sales tax exemptions for a certain period of time. In discussions with New Jersey officials, Amazon had sought a 22-month reprieve before it would need to begin to collect tax. [N.J. Gov. Chris] Mr. Christie estimated that the new agreement, which followed months of negotiations and hinged in large part on the timing of sales tax collections, would result in $30 million to $40 million a year in additional tax revenue for the state." After fighting the tax issue for years, Amazon "suddenly and somewhat surprisingly" changed its position in November, says Sucharita Mulpuru, an analyst at Forrester, which specializes in technology research. "We don't know for sure, but we think this is meant to do with plans to have a more physical presence in various states," she says. "Amazon might be planning to do something like the Apple store to sell their Kindle e-readers and tablets." That would transform Amazon into a "clicks-and-mortar" hybrid. The mortar part of the equation, Mulpuru says, would make it impossible for the Seattle-based company to avoid collecting the tax any longer. There's something else at work, perhaps. According to a survey by Forrester, only about 8 percent of people indicate they'd shun an online retailer for charging sales tax, and it's unclear whether they'd then opt for a traditional retailer or simply Google a better deal online, Mulpuru says. Even so, eBay and many other online retailers are standing their ground on the issue. "Naturally eBay is vehemently opposed to anything that might rock the eBay boat," the Silicon Valley-based company says on its website. "eBay does not issue 1099 tax forms to sellers, nor does it report seller's sales figures to the IRS. Ebay considers itself merely to be a facilitator, meaning that they provide a marketplace in which buyers and sellers come together to do business." Then there's the Marketplace Fairness Act pending in Congress, which would require all but the smallest online retailers to collect state sales tax across the board. Mulpuru wonders whether such a federal bill dealing with the collection of state taxes would even pass constitutional muster. "It's also hard to imagine that in this political environment, such a hot potato as this could get passed," she says.